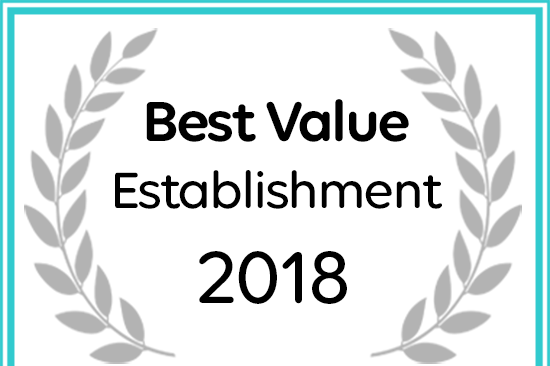 Ukarimu Guest House in Wilkoppies has won a 2018 Best Value Award. Ukarimu (pronounced oo-KAH-ree-moo) is a Swahili word for hospitality and tranquility. According to the Swahili's, female babies who are named Ukarimu are believed to have a peacefull, clear and quiet yet practical nature and a clever and inventive mind. Ukarimu Klerksdorp Accommodation is situated in a quiet suburb of Klerksdorp, a city in the North West province of South Africa, with access to many tourist routes and activities. When travelling from Johannesburg, Klerksdorp is only 175km on the N12 route towards Kimberley and Cape Town. Tastefully furnished double rooms with en-suite showers, as well as disability access are offered. Bedrooms have double beds or twin beds and are equipped with fridges and microwave ovens, tea and coffee facilities. A walled swimming pool and recreation area is available to guests. Guests are invited to relax on the patio or next to the swimming pool. You can have a great barbeque with provided kettle braai's, or should you prefer, just enjoy the beautiful gardens and bird life. Our passion is to provide a peacefull and relaxing atmosphere to all our guests where you can either relax in peace or work at your own pace without being disturbed. 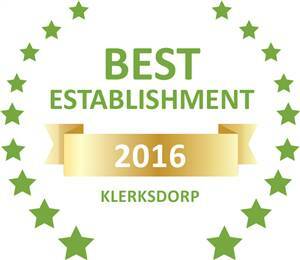 Ukarimu Klerksdorp Guest House Accommodation is owned and operated by Karin Erasmus who, assisted by her capable staff, wish to ensure through service excellence, that your stay meets all your expectations. Please contact us for special requirements or any additional information you may require. We offer stylish B&B accommodation at affordable rates. Aimed mainly at travelling professionals and visitors to the nearby Wilmed Park Hospital, all efforts are made to offer a peacefull and relaxing atmosphere to our guests. In a radius of aproximately 2km, you will find supermarkets, department stores, pharmacies, doctors' dentists' and specialists' rooms, banks and various ATM's. Anncron Life Hospital and Sunningdale Hospital are both only 5 minutes' drive away.